Its high-time Americans wake up and realize our nation is under a continual threat of tyranny. Now let’s step off the soapbox and get informed. When and if (when stressed more than if) the federal government uses light-armored vehicles against Americans, we will need to be fully informed prior to their use. You will need to know what an MRAP is, its capabilities, and its weaknesses. This guide will assist you and your survival group. An MRAP is a mine-resistant ambush protected light armored vehicle, ergo the acronym MRAP. There are several classes of MRAPs; RG33, MRUV, JERRV, M-ATV, MRAP II Cougar, BMRV. There are at least 22,000 MRAPs currently being used by US Armed Forces, and over 2,700 MRAP Cougars in use by the Department of Homeland Security. With plenty more MRAPs in production. MRAPs being used by DHS have been retrofitted for domestic missions, which means nothing at all because the vehicles still maintain their battle-ready capabilities. The best offense is a good defense. The MRAPs have led to countless successful missions in the Middle East. This is primarily due to the MRAPs hull, V shaped and protected by Frag Kit 6 armor. MRAPs can withstand explosive damage caused by improvised munitions and IEDs (improvised explosive devices). The MRAP protects a crew of up to eight and two vehicle operators that includes a gun-shield for.50 Caliber M2HB/7.62mm Caliber M240G operators. The FK6 Armor provides effective blast mitigation while protecting from fragmentary damage. Basically, even after suffering significant damage, the MRAP can continue moving, an added benefit of the Hutchinson run-flat tires. With further retrofitting by DHS of MRAPs, a target-acquisition sensor turret can be mounted to the vehicle equipped with .50 Caliber M2HB or a MK19 40mm Grenade Launcher. Ironically, this turret system is known as XM153 CROWS II (Common Remotely Operated Weapon Station). CROWS II Operators acquire targets with the use of day cameras, IR (infrared) cameras, and laser guided range finders…all within the safety of the RG33 MRAP. MRAP Cougars are equipped with MaxxForce 10 engines with 375hp capable of reaching speeds of 65 mph with a range of approximately 420 miles. Its maximum payload is up to 6,000 lbs. for a combined weight of 38,000 lbs. 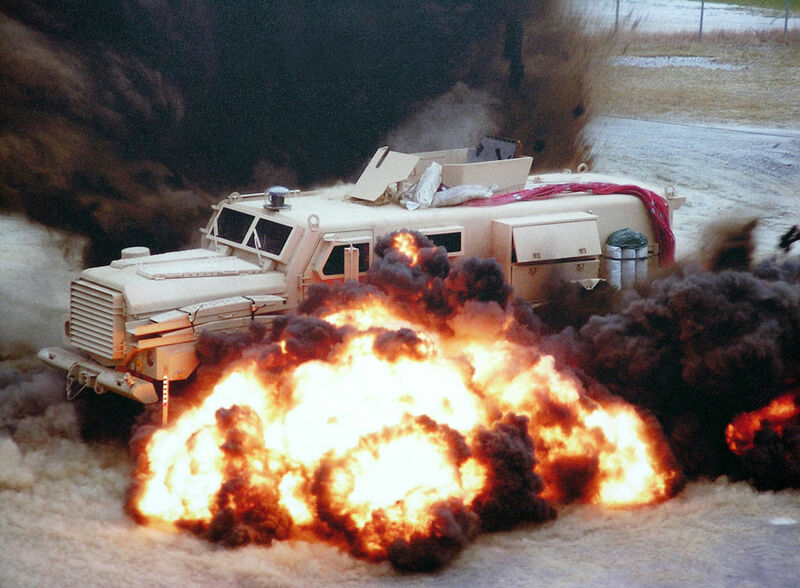 The MRAPs have significant weaknesses that can be exposed during combat. However, MRAPs will pose a considerable threat to your militia or survival group. Integrate MRAP disabling in FTX until you have battle-tested methodology established for disabling light armored vehicles. The primary disadvantage civilian based militia and survival groups are faced with is the unavailability of required military-grade ordnance. Survival and militia groups should understand the need for improvised munitions while identifying responsible munitions application planning. EFPs/SEFPs are self-forging warhead projectiles that produce a shaped charge to penetrate FK6 armor from standoff distances. Warning to reader, EFPs should only be used during SHTF Situations, Martial Law, and Foreign Attacks under strict ROE (rules of engagement). Don’t have any EFPs in your bunker? Thought not. This is where improvised munitions i.e. explosive devices come into theater. While IED EFPs and SIM EFPs are not military grade, they are still effective to a certain degree. The charges are generally cylindrical, fabricated from commonly available metal pipe, with the forward end closed by a concave copper disk-shaped liner to create a shaped charge. Explosive is loaded behind the metal liner to fill the pipe. Basically, the housing is glass filled polyurethane with an iron liner packed with a RDX C-4 mixture. A military-grade example of this is the M2 SLAM(selectable lightweight attack munitions). Which is pocket sized and only a couple pounds. Don’t let the size fool you, the M2 SLAM can pierce the MRAP armor from 25 feet. For detailed instructions you can study the US Army Issued Improvised Munitions Handbook. To some degree .50 caliber firearms like the .50cal Browning Machine Gun (BMG) and the Barrett M82 can be effective, the disadvantage is unit exposure. Forcing the operator(s) to give up their position, in addition to engaging a target equipped with aerial support communication with surrounding ground forces. At all times, survival groups and militias should consider size of forces and ordnance in theater before engaging an MRAP. The MRAP has a high center of gravity, thus making the American landscape a weapon against MRAP units. With the use of CCD, Decoy Tactics, and unit force application creating controlled movement into defined positions that include; weak bridges, bad roads, roads above grade, embankments and etc..
With this tip and disable method survival groups run a lower risk of exposure while preserving ammunition and ordnance. However, if hull penetration is required after the disabling of an MRAP the operators are likely to engage your group. Before approaching, your unit must take cover positions and engage the operators as they evacuate the MRAP. Unit leaders should always make the call…eliminate, or apprehend. Apprehension is only contingent upon overall mission success. Survival groups can protect established FOB’s (forward operating bases) and strategic sites by using a very old trap known as the pitfall. This method is typically used for animals, but the same methodology can be applied in the presence of suitable time allowance. Pitfalls are holes in the ground with a false floor that have been camouflaged and disguised to emulate the floor-bed. Due to the size of LAVs/MRAPs the hole would have to be at least 18 x 8 x 4. This method should be applied by militia groups of substantial size that allow for a group of six to dig the hole in less than an hour, or when a backhoe is available. Urban MRAP disabling will be reliant upon IEDs and .50 caliber rifles, other considerations can be made for smaller townships with fewer POEs (points of entry) that can be blockaded. Upon the arrival of one or more MRAPs at the POEs, militia units can acquire MRAP targets from a more advantageous position. Blockades should consist of heavy equipment, abandoned cars, and other heavy payloads that are beyond the MRAPs debris clearing capabilities. Militia Exercises of this nature should take into account the MRAP CROWS II and M240G Operators capable of engaging targets occupying highrises and other buildings. In closing… MRAPs are nothing to joke about, they are a threat to your survival group and should always be treated as such. A fair amount of deliberation took place before the writing of this article due to the active use of MRAPs in the Middle East by American Armed Forces. However, the methods reviewed in this guide had previously been established or are not operationally effective against USAF MRAPs in the Middle East.